-2: "Where No Man Has Gone Before"
-13: "The Conscience of the King"
-22: "The Return of the Archons"
-23: "A Taste of Armageddon"
-28: "The City On the Edge of Forever"
Strangely, Star Trek's first pilot didn't lead directly into a series. Instead, it lead to this second pilot, and a second chance to sell itself to a network according to their beliefs about what would make a great TV series. This opened the door for some big cast changes, some for better, some for worse. Enter William Shatner as our new Captain of the Enterprise. In actual fact, three scripts were commissioned to compete for the job of second pilot. Samuel Peeples' efforts eventually got the job done, with the other two scripts turning into regular episodes of the series later on. Some of the strengths of this script include its methods of introducing audiences to the Trek universe and its population, and also that the central figures focused on today featured compelling levels of characterization. We also get the more standard action finish that many executives felt was missing from the previous pilot, and there are good levels of mystery and tension building towards this climax. But sadly, the overall premise of today's story, though decent, really isn't all that grand or inspiring. It truly is bizarre that this story wasn't used for the first broadcast episode on September 8, 1966. Production Executive Herb Solow says it was felt that this story was "too expository". Exactly how does that hold up as a reason? If the audience is completely brand new to the Star Trek universe and its characters, why would they not want and need that exposition? Sometimes I think those media professionals who habitually deride exposition need some kind of wake-up call to snap them out of their self-induced stupor. Make exposition more exciting and gorgeous and classic if you have to, but never avoid it or hurriedly toss it off into the corner. It's too important. And "Where No Man Has Gone Before" does a pretty good job of focusing on exploration first and foremost, taking us on a tour of the types of environments that Star Trek will bring us week after week, and introducing many of the most important characters of the series. It's not quite as good or quick at this as its predecessor "The Cage", but it's still solid. This is the story that introduces us to Captain James Kirk, and we get some good insight into his personality and command style. Most importantly of all, although he has clearly already met Mr. Spock before the story opens, this tale shows how they closed the gap of their initial philosophical differences to form a working relationship with each other... a relationship that they will enjoy and rely on throughout the rest of the show, and throughout the rest of their lives. That's good material for a first broadcast, and that material is a solid strength here. It's also a development that comes as a bit of a surprise to Captain Kirk, who initially believes that his closest confidant on this five year mission will be his old academy buddy Gary Mitchell, played by actor Gary Lockwood who would go on to feature as astronaut Frank Poole in Stanley Kubrick's classic sci-fi film "2001". The friendship between Kirk and Mitchell is played with a sense of fun and warmth by the actors, and becomes a successful backbone against which the events of the story take their toll. Also making his debut in this episode is Montgomery Scott, played by James Doohan. Scotty gets a good number of lines to say and things to do in this story, including appearing as the Chief Engineer in the line-up of department heads. However, it is curious to see the character of pilot Lee Kelso, played by Paul Carr, spending far more screen time tackling engineering and technical fixes than Scotty does, and Scotty often seems to be reporting to him. Is Kelso the real head of engineering at first? Kelso is quite likeable, and seems an easy shoe-in to become a regular or semi-regular. One is tempted to keep one's eyes peeled to see if he can be spotted in any future episodes... until, in this very episode, he becomes the first character to die on screen in Star Trek. Bummer. But this also gives one the impression, perhaps falsely, that Scotty's duties were ramped up so that he could fill the gap created by Kelso's absence. Falling pretty flat is Paul Fix's bland portrayal of Dr. Piper, who, to be fair, doesn't really get a scene of any real significance in the entire show, although it does feel as though his examination of Mitchell in sickbay has had most of its footage sent to the cutting room floor after the fact. Is it in Vonda N. McIntyre's novel "Enterprise: The First Adventure" where it is retroactively rationalized that Kirk always knew he wanted his colleague "Bones" McCoy along for this mission, but arranging McCoy's complicated transfer involved temporarily putting up with Piper for a bit? Yeoman Smith is another casualty of lack of attention from the script, and she manages to have far less to do than her counterpart in the previous pilot, while she expresses virtually no emotion whatsoever while doing it. It seems it would have been better to not try to cast a regular yeoman until there is a script that is prepared to use the character in some fashion. Another easy to forget series regular making his debut here in this episode is Mr. Leslie, played by Eddie Paskey. Don't remember him? Well, he's only a background "extra" character, often seen but only heard speaking lines in a few rare episodes, and even more rarely actually getting a credit at the end of the show. He usually wears a red shirt while having an uncanny knack for staying alive, but today he's in blue. He is most easily spotted on the planet, standing outside the cell with Kirk and Spock. Lastly amongst this crew is psychologist Dr. Elizabeth Dehner, played by Sally Kellerman, a character who has a small hint of the coldness of the previous pilot's Number One character, but who is much more emotionally rounded in general, and even passionate about her areas of expertise. She is also worthy of becoming a regular or semi-regular, but instead has an important story-specific role to play as a guest star. This story will squeak by with a grade of C- in astronomy. Armed with foreknowledge of how our Milky Way Galaxy will be divided into four quadrants in future centuries in the Star Trek universe, quadrants that take a long time to cross and remain largely unexplored in Kirk's time, it seems a bit lax that this episode could have Kirk casually announce that the ship will now leave the galaxy, and that upon doing so will find it surrounded by a funky magical barrier. Perhaps we have to think beyond the automatic impression that we get.... Perhaps we should think about the galaxy three-dimensionally, with the Enterprise not traveling out beyond the external edge of the galactic disc, but rather "up" or "down" beyond the plane of the disc - a somewhat shorter and more plausible journey. It's also more plausible if this barrier only covers a small section of the galaxy, perhaps a few hundred light years across, somewhere far from Earth's solar system. 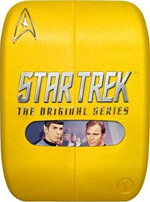 While the premises of "The Cage" and "Where No Man Has Gone Before" both work well to build up a sense of the Enterprise crew digging into mysteries and exploring unknowns, in both cases the plot uses a device perhaps best labeled with the phrase "going where someone else HAS gone before". Both stories get great mileage from receiving messages from those who have gone before and had great difficulties, helping to raise the stakes and increase tensions. In astronomical terms though, this doesn't require that the barrier surround the entire galaxy - only that Kirk's crew should be aiming for more or less the same spot as the previous crew, so it's manageable. Today's planet only really comes up in the second half. Its name "Delta Vega" feels as though it's been plucked out of the air by people who have heard Bayer notation from astronomers, but have no idea how to put it together themselves. A minor nit. This story tackles the topic of Extra-Sensory Perception, or ESP, which I thought was quite cool and forward-looking for the time. This is actually just a springboard to get into all kinds of mental powers in a semi-plausible way. I like that, and I think it worked fairly well. But the central premise falls down a bit in terms of how it remains subservient to the predetermined dramatic arc of the episode. To me, it doesn't feel like there is sufficient reason given for Gary Mitchell to rapidly develop towards villainy. The best thing we actually have is the concept that his knowledge is expanding to such profound levels, that we can truly have no concept of all the new things filling his mind - and somewhere in that nebulous mass of new thought he has sufficient reason. What it really feels like is that the "smaller minds" have control over nature here. Whatever Kirk and Spock and Kelso and Sulu fear most dictates what Mitchell will turn into, whether that makes sense for Mitchell or not. I actually think Anakin Skywalker's moral decline in the Star Wars prequels was more believable, because it starts out with him simply wanting to hold on to the people he loves and cares about, and he uses his powers to try to maintain attachments. Far more relatable. Mitchell seems too keen to discard his relationships in this one. To what extent are Kirk and Spock and friends forcing this choice on him by fueling their own fears and acting on them? And so, in a sense, this ends up being a much darker story than its predecessor "The Cage", and has a largely down-beat ending, but for the first formative sparks of the Kirk-Spock relationship. The story is also one of the big anchor points for the evolutionary journey of Spock's own philosophies. Beginning here, we will often hear Spock justify his thoughts as being logical, without truly examining the over-arching philosophy that his logic is used to support. At this early end of the spectrum, his logic supports fear. Spock isn't getting emotional about his fears, but he is definitely acting on the philosophy of fear. His concerns are the survival and protection of himself, and his ship and shipmates, and he is prepared to go to murderous lengths to achieve those goals. It is actually a sad place that we see him in here, where he is really faced with the unknown, and does not greet it with the olive branch of hope and goodwill, nor does he have faith that bright trained Starfleet officers will maintain any loyalty to their fellow species when their abilities are exponentially increased. But there is yet hope for Spock and he will grow. The other end of this journey, in the sixth feature film and the Next Generation story "Unification", will see him completing a total turnaround on this point, and that also will be done with equal amounts of logic. Production value remains high for this story as it was for the previous pilot, re-using the difficult-to-light mountain cyclorama for the planet set, adding new elements to the planet and the Enterprise, including all desired special effects for laser blasts and space barriers, and achieving a number of the all-time classic model shots for the Enterprise, now smartly sprinkled throughout the story wherever necessary. I particularly like the additional red highlights that have been painted all around the bridge, bringing the colours to life in this very important set. All very good. Interestingly, though it seems to escape the notice of some viewers, we actually have three uniform colours for the crew at this point. Apart from the strong blue of the science people, Kirk is wearing a yellow shirt that has a slight tint towards green, as do many of the others on the crew. However, there is also a very light "peach" coloured shirt as well, as worn by Gary Mitchell, Scotty, and a few others. It does register nearly the same as the yellow to the casual eye, and I think that the move to a much bolder red for the rest of the series was ultimately a good move. This is a very good second pilot, and it worked well and sold the series to its first network. However, something of the essential philosophy of Star Trek doesn't quite come through in this story. It has a somewhat less than positive approach to humanity's ability to explore and deal with the unknown, or to appreciate that which is different. Read the next Star Trek review: "The Corbomite Maneuver"
This story is available on DVD and Blu-Ray. Watch the legend develop from its infancy. 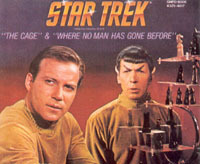 Set contains 29 episodes from the first season in their original wacky broadcast order, including "The Menagerie Parts 1 & 2" which used footage from the original unaired pilot "The Cage". However, "The Cage" itself is only included with the Season Three Box Set. original restored broadcast versions of the 29 episodes. Text only commentary by Denise & Michael Okuda on "Where No Man Has Gone Before", "The Menagerie Parts 1 & 2", and "The Conscience of the King". "The Devil in the Dark", and "The Squire of Gothos". 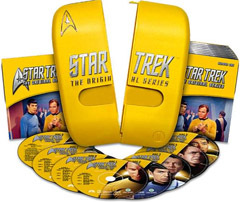 The re-mastered Star Trek sets are more readily available, and in addition to picture and sound quality restoration, liberties have been taken with "upgrading" the episodes. Most famously, new CGI effects and optical shots have replaced many space scenes, matte paintings, and phaser effects. Unlike similar upgrades applied to select Doctor Who DVD releases since 2002, the CGI effects cannot be turned off to see the original effects. The kicker for me comes from reports that the episodes have been rescored with new music. Interesting, funky, but since it's primarily the original music I'm after in the first place, this was not the set for me. Another curiosity: Season One was released on double-sided discs, with standard DVD on one side and HD on the other. Reportedly, not all extras are accessible on the standard DVD side. However, by the time the remastered versions of seasons two and three were released, HD had clearly lost the standards war to Blu-Ray, and so seasons two and three "remastered" offer standard DVD only yet again. Starfleet Access interactive trivia plus picture-in-picture interviews for "The Galileo Seven" (HD version only). "Beyond the Final Frontier" History Channel documentary (SD, 90 min.) with host Leonard Nimoy. Star Trek sets are now available on Blu Ray. Picture and sound quality restoration has gone up yet another notch since the remastered version, as have the liberties taken with "upgrading" the episodes. Once again, even newer CGI effects and optical shots have replaced many space scenes, matte paintings, and phaser effects.... but this time the upgrades have the same respect and user-functionality applied to select Doctor Who DVD releases since 2002, as the CGI effects can now be turned off to see the original effects. Good show. It seems that the music has still been tampered with too much for my liking though. option to watch episodes with original or new CGI effects. Spacelift: Transporting Trek into the 21st Century featurette (HD, 20 min.) covering the restoration, CGI effects, and music upgrades. plus all documentaries, featurettes, and episode promos from the "purist" standard DVD set listed far above. "Where No Man Has Gone Before" is also available in an "unaired" version on the season three Blu-ray box sets - but only for the Blu-ray! Standard DVD for season three doesn't have this at all. option to watch original or new CGI effects.